Baltimore Harbor Light / Baltimore Lighthouse / Lighthouse Preservation, Restoration & Tours. For over one hundred years, Baltimore Harbor Light has guided northbound vessels to the Port of Baltimore, and southbound vessels on their way to the Atlantic Ocean. Located just north of the mouth of the Magothy River, Baltimore Harbor Light sits 1.5 nautical miles off the shore of Gibson Island, where it marks the southern entrance to the Craighill Channel. Commissioned in 1908, Baltimore Harbor Light was the last lighthouse constructed on the Chesapeake Bay, and the most challenging to build. 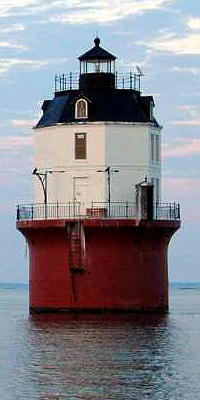 From the time the original request for funding was made by the Lighthouse Board, in 1890, it would be eighteen years before the light was commissioned. The final cost of construction was well more than triple the amount originally requested. The Chesapeake's soft bottom meant that the caisson would need to be sunk deeper than any other caisson had been before. Like an iceberg, there is much more to this lighthouse than what one sees on the surface. Contribute to the Baltimore Harbor Light Preservation and Restoration Campaign. The new keepers of the light are hard at work, repairing and preserving this treasure of the Chesapeake. Please help support the restoration efforts of this National Register structure. Contribute today and you will receive an exclusive gift.